Canis Wolfborn, the Fangrider is essentially a Wolf Guard Battle Leader with extra wounds and attacks who allows you to take Fenrisian Wolves as Troops while giving them a Leadership and Initiative boost. The Wolf Priest theorise that Canis was somehow lost in the wastes and raised by a brooding she-wolf in whose lair the young Canis found shelter. And having been raised by Fenrisian wolves, all wolves great and small now instinctively obey his commands. In battle he rides Fengir, the largest of the Thunderwolves into battle, which accounts for his improved stat line and extra attacks. Canis Wolfborn is a pure close combat character who works best in the thick of the fighting, surrounded by as many enemies as possible. But without an invulnerable save he does require a little bit of looking after. Skills: Saga of the Wolfkin, Rending, Wrath of the Savage, Lord of the Wolfkin, The Wolf King. Any unit of Fenrisian wolves within 12″ may use Canis’ Leadership instead of their own. It’s a nice bonus, but it’s not going to win you any games, especially when Canis’ Saga of the Wolfkin gives Fenrisian Wolves a Leadership boost already. This ability allows you to field Fenrisian Wolves as Troops in an army joined by Canis Wolfborn. Unfortunately Fenrisian Wolves cannot claim objectives. Still, this does allow you to take 2 minimal, cheap troop choices so you can max out on units designed to obliterate your enemies instead. Lately some players seem to prefer this to bothering with objectives. After all, if the enemy are all dead, you win automatically anyway! Out of a 1,750pts army, spending 80pts on 2 Troop units so that you can spend 1,670pts on Long Fangs, Land Speeders, Thunderwolf Lords, Thunderwolf Cavalry and Wolf Guard Terminators in Land Raiders could put you at an awesome advantage -Especially if your opponent has spend at least 300 points on standard objective grabbing units that don’t do much all game. Instead of using his regular 6 attacks (that’s 5 +1 for a pair of wolf claws), Canis may choose to use the number of enemy models in base contact with him as his basic Attacks characteristic. We managed to surround Canis with 10 models in base to base contact, giving him a total of 10 attacks +1 for his Wolf Claws. So that’s 11 attacks in total and we used his Wolf Claws to reroll to hit, because his Thunderwolf puts him up to Strength 5, so rerolling to wound wouldn’t be as much of an issue. Remember that because of his Wolf Tooth Necklace, he always hits on a 3+ as well. So statistically, that’s 11 attacks, producing 8 hits, rerolling 3 fails and getting 2 more hits for a total of 10 hits! Providing he’s attacking Toughness 4 models, his 10 hits should produce approximately 7 wounds with no armour saves allowed. And because Canis is Initiative 5, he’s likely to strike first as well. However, of those 3 models remaining, 1 of them will probably have a Power Fist. So be carefully, otherwise Canis will cause a great deal of damage, only to get pummelled in return. It’s easy to overlook this, because you’re going to be attacking with Canis’ Wolf Claws, but don’t forget that when attacking vehicles in close combat Thunderwolf Cavalary have the Rending ability which will help you to pierce armour -especially if you end up in close combat with a Dreadnought. For obvious reasons, you wouldn’t have Canis leading any of these units. They’re simply not fast enough (or move at a different speed in different phases) and would tie him down. We had considered putting him in with a pack of Blood Claws as they always run forward anyway. However, for competitive purposes we’d advise against taking Blood Claws altogether, because they’re not a patch on Grey Hunters. While this seems like an obvious choice, it’s actually an extremely expensive one! Many people have stopped taking big units of Thunderwolf Cavalry simply because they cost so much in points. Similarly, attaching a character like Canis to them makes the unit even more expensive and puts all of your eggs in one big basket. Because Canis is going to do most of the damage, giving him 2 Fenrisian Wolves as wargear and attaching him to a pack of Fenrisian Wolves is a great way to get him across the board and into close combat. Who cares if all those wolves get shot at? Getting Canis into close combat and surrounded by enemies is what you need to do. Any Wolves that make it in can be used to tie up any Powerfists and keep them out of base to base contact so that Canis can continue to butcher the enemy for another turn. Canis Wolfborn is good fun to play because of all his extra attacks and Wrath Of The Savage ability. 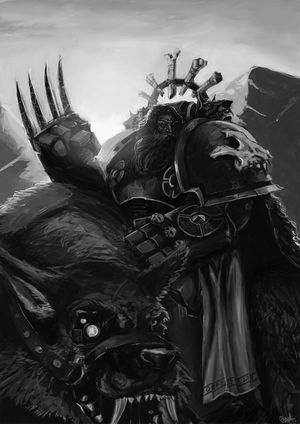 However, many players would prefer to take a Wolf Lord riding a Thunderwolf with the Saga Of The Warrior Born instead. The Thunderwolf boosts his Toughness, Strength and Attacks by +1. So he can’t be instantly killed by a Strength 8 Powerfist. The Wolf Tooth Necklace ensures he always hits on a 3+. The Wolf Claw allows him to reroll to hit or reroll to wound. This works well with the Wolf Tooth Necklace to make sure you inflict as many wounds as possible. The Runic Armour and Storm Shield obviously helps to keep him alive, as do the ‘ablative Wolves’. Finally, Saga of the Warrior Born works with the Wolf Tooth Necklace and Wolf Claw to keep the number of successful kills as high as possible turn on turn. All this comes to 280, while Canis costs 205pts. The extra 75pts buys you survivability and a Saga that doesn’t need you to be dangerously surrounded by enemies in order to benefit from it. You just have to kill things. So after comparing these two units, the only real benefit of taking Canis is his ability to make Fenrisian Wolves Troops choices for the army, which is totally not worth it -Especially when Grey Hunters are such useful Troops choices to have, even if they can get quite expensive with all their upgrades. Our advise is to get the Canis Wolfborn model and convert him into a Thunderwolf Lord with a storm shield. That’s a nice and simple conversion!